When I was young I was making aircraft from wood I found on our farm in Vermont. As far back as I can remember I have always been interested in aircraft so it stands to reason that the Air Force would be my choice. The Navy was also a choice but I don’t swim well. So the Air Force won out. My Dad was the reason that I decided to make the Air Force a career choice. The year was about 1964 and I was very interested in my Dad’s occupation with J&L located in Springfield VT. He showed me his pay stub and I was amazed as to the monthly dollar amount. He followed up by saying that he had been on strike and out of work about 3 months every 1 to 2 years and explained that if staying in the Air Force was up to him, and if he had that choice, he would stayed in for 20 years. June 1966 I went from the 18th TFW, Kadena Okinawa to the 388 TFW, Korat, Thailand where I decided to re-enlist. This decision was based on the conversation I had with my Dad back in the early years of my first enlistment. 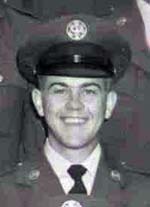 When I re-enlisted in 1966, I made the determination at that point to stay for the full 20 years. 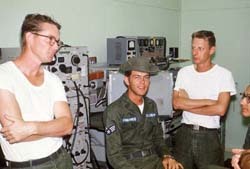 I was given the chance to receive my variable re-enlistment bonus tax free by flying in a C-130A aircraft over South Vietnam to Misawa AB, Japan delivering communications equipment. I have never been sorry for the decision I made based on my Dad’s input. My career spanned 20+ years with the shortest assignment of a year while at Osan AB, Korea and the longest of 3.5 years while assigned to FTD 908, Lakenheath AB, England. I averaged a move about every two years. Yes, if this question also includes combat support while I was stationed with the 388 TFW, Korat Thailand from June 1966 to June 1967. 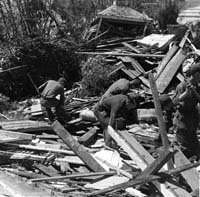 For humanitarian operations I was involved in the clean up of the Gulf Coast after it was decimated by Hurricane Camille. Some of my finest memories are of the six years as a Nav-Aides System Instructor which started in 1969 and lasted until 1975. That teaching path continued after retiring while I was employed by Telemedia in support of technical training of the TNI-Au, Indonesian Air Force from October 1983 to October 1986. On return from Indonesia in August of the following year I was employed by Raytheon Marine Company as Senior Instructor for Shipboard Surface Search Radar and Automatic Radar Plotting Aides (ARPA). Of all 15 assignments, probably my best memories are while stationed at FTD 908, RAF Lakenheath, England (longest assignment) as the Navigation Aids Instructor. This detachment comprised a very close knit group of professionals that while on duty performed the training requirement for the 48th Tactical Fighter Wing and when tasked, the training requirement of United States Air force Europe (USAFE). My least favorite and also my first and shortest assignment was of Lackland AFB, TX. I grew up on a farm in Vermont and this was my first time to be away from home and my family. Needless to say this was a culture shock plus an eye opener as to what the military was all about: discipline, following orders without question, discipline, discipline and even more discipline. In August 1969, Hurricane Camille, the third and strongest tropical cyclone and second hurricane during the 1969 Atlantic hurricane season, made landfall at Waveland, Mississippi, causing massive damage and destruction across much of the Gulf Coast of the United States. There was additional flooding and deaths inland while crossing the Appalachian Mountains of Virginia. It was the second of three catastrophic Category 5 hurricanes to make landfall in the United States during the 20th century. The Coast Guard, Air Force, Army, Army Corps of Engineers, Navy, and Marine Corps all helped with evacuations, search and rescue, clearing debris, and distribution of food. I was stationed at Kessler AFB, Mississippi at the time and we were sent in to help clear fallen trees in the Biloxi, Mississippi area. I was in charge of one of the many chainsaw details charged with this mission. This was a very demanding as well as rewarding detail and I still remember as if it was yesterday. In total, Camille killed 259 people and caused $1.42 billion (equivalent to $9.13 billion in 2014 dollars) in damages. 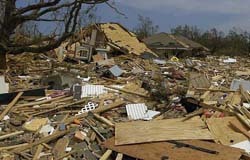 In August 2005, thirty six years after Camille, Hurricane Katrina’s winds and storm surge reached the Mississippi coastline killing 234 people. Air Force Commendation Medal (1st Award). 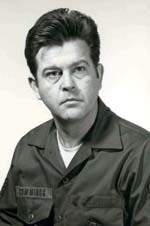 Order G333, 14 July 1967 – By direction of the Secretary of the Air Force, the AF Commendation Medal was awarded for meritorious service during 15 June 1966 to 11 June 1967 while assigned to Korat Royal Thai Air Force Base Thailand. Air Force Commendation Medal (2nd Award) Order G56, 23 Oct 1969 – By direction of the Secretary of the Air Force, the AF Commendation Medal was awarded for outstanding achievement during 17 Aug 1969 to 1 Sept 1969 while assigned to Keesler A FB MS for exemplary ability, diligence and devotion duty during the clean-up after Hurricane Camille. Air Force Commendation Medal (3rd Award) Order GA-0112, 15 Sep 1978 – By direction of the Secretary of the Air Force, the AF Commendation Medal was awarded for outstanding achievement during 23 Mar 1977 to 21 Sept 1978 while assigned to 6100 LSS, Kadena AB Japan. 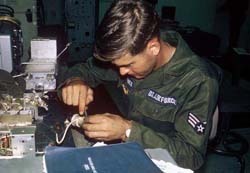 Meritorious Service Medal for outstanding service as NCOIC, Navigation Section and Communication-Navigation Branch NCOIC, 62d Avionics Maintenance Squadron, McChord AFB, Washington from 2 August 1982 to 30 June 1983. 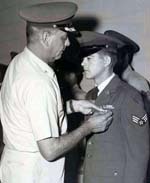 My second award of the Air Force Commendation Medal is the most significant to me as the award was given for service that I and many other Air Force members performed in the cleanup operation of the Gulf Coast after Hurricane Camille. Prior to the storm, I secured my quarters which entailed cleaning the bathtub and filling it with water for drinking and cooking. 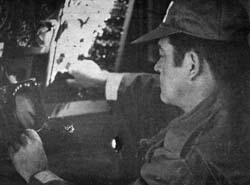 My family and I then took shelter in Dolan Hall, which was rated as a nuclear shelter and was my place of duty teaching airborne navigation systems. If I remember correctly, Camille hit the Gulf Coast in the early afternoon August 17, 1969 and we were released from the shelter after the storm in the following morning. Everywhere you looked was complete destruction. Downed trees, power lines, and where buildings once stood there was nothing left but rubble. This endeavor lasted many days and weeks until all roads were passable and the citizens of the Gulf Coast were able to move again. There were many examples that I could choose from over the course of my military career. But MSgt Thomas L. James, Chief Comm/Nav Branch was my reporting official and when off duty, also a very good friend. MSgt James and I had similar ideas on how to make the Comm/Nav section the best in SAC. I think often of the time I was stationed at Griffiss AFB, NY with MSgt James and the 416 AMS. 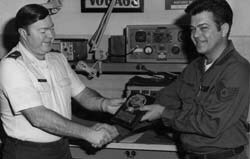 MSgt James submitted me for Airman of the Month for November 1979. I won the 416 AMS Airman of the Month and went on to win the 416 Bomb Wing Airman of the Month, the 45 Air Division Airman of the Month, and the 8th Air Force Airman of the Month. I am very proud of those achievements. I was stationed at Griffiss AFB, NY and I was authorized to drive my personal vehicle to an aircraft to inspect and sign off forms after maintenance was performed. 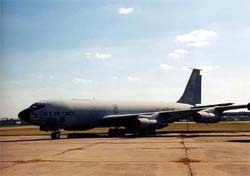 I parked my car in front of the KC-135 and boarded the aircraft, inspected the work and signed the 781 aircraft maintenance records. The aircrew then arrived to go on a mission and I departed the aircraft. Upon arriving at my car, I found the doors to be locked and the windows were shut. It was required that all vehicles on the flight line to have the keys in ignition when the vehicle was not occupied. Now keep in mind that the aircrew was aboard the aircraft and the engines where being run up – I was scared! So I asked a young crew chief that if he had any experience in breaking into cars would he please break into mine. He replied with a yes and within 5 minutes I was able to drive away just before the aircraft was about to taxi to the runway. After retiring from the Air Force in June 1983 I was unemployed from June to Oct 1983. I was then hired as a Subject Matter Expert (SME) on the AN/APS-133 color radar. I was then contracted to go to Jakarta Indonesia to write training materials and later teach these materials on APS 133 color radar to the TAI-AU (Indonesian Air Force personnel). After completion of the Indonesian contract, I returned to the USA and was later hired (August of 1987) by Raytheon Marine Company as Senior Instructor teaching shipboard surface search radar (AN/APS-64, RAYCAS, RAYPATH, ST/ST Mark2 Automatic Radar Plotting Aid (ARPA) and the Electronic Charting Display Information Systems (ECDIS). I retired from Raytheon Marine Company in June of 2000. From the year 2000 to 2002, I was given the opportunity to conducted radar and ARPA maintenance training courses at Maine Maritime Academy, Castine Maine and Raytheon Marine GMBH, Kiel, Germany. 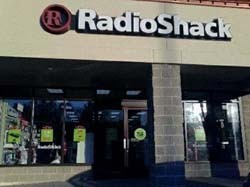 I joined RadioShack in 2003, and am currently employed with them as a sales associate at a store in Bedford, NH. Life Member of the Non-Commission Officer Association (NCOA). Life Member of the Air Force Association (AFA). I am up early each day (0500) which I attribute to military service. Also I am first to arrive at appointments and scheduled functions – usually by 15 minutes. Punctuality is a learned trait, which I have valued my whole adult life and I’m grateful to my Air Force service for teaching me this most basic of attributes. Serving should be viewed as an honor and I feel honored to have served. As a military member you will meet and win friends and have memories that will last a life time. I cherish the memories of my service and the many, many service members of all services I have met. As you travel the world as a military person, take as many photos as you can as they will keep your service memories alive for many years to come. TogetherWeServed has provided a great means where I can enter 20+ years of military service along with photos and review this service record of mine and those of others in a concise and easy to view web page.